Contact Sunfresh Farms today for a list of processed locally grown produce and prices. Our processing facility allows for quick, efficient and sanitary processing of locally grown Alberta produce such as but, not limited to the following. Our carrot peeling equipment allows for efficient production with minimal manual labor. The carrot is put through an automatic peeler that quickly removes the outside layer. The peeled carrot is then guided through a machine that trims off the ends. 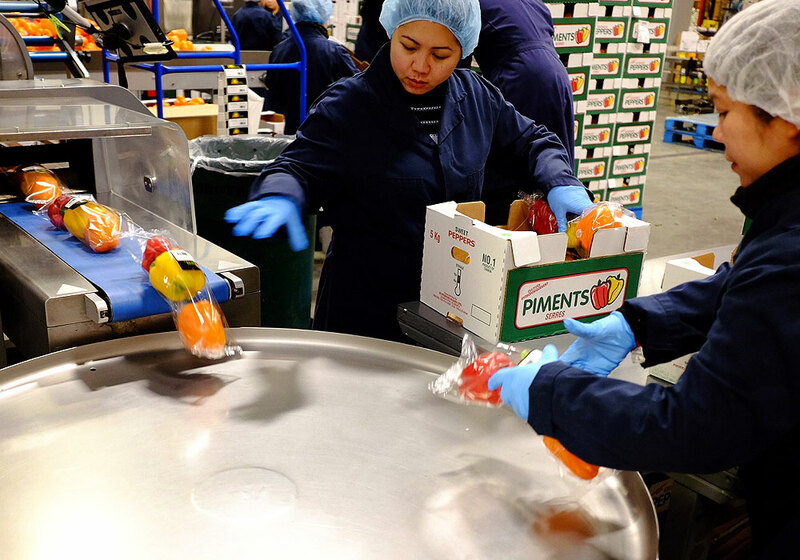 From there, the carrots are inspected for peeling quality, sizing and then sent down the line for sanitization and packaging. Our stainless-steel machines cut, wash, and cool the lettuce down to the desired temperature. High power driers then spin the lettuce until it is ready to be packed and vacuum sealed. Our semi-automatic machine cuts the top and tail end of every onion. Strategically placed razors then slit the peel. A high velocity blower sheds the outer layers away revealing a perfectly whole peeled onion. They are then sanitized and transferred to our dicing and slicing lines if applicable. Semi-automatic equipment allows for quick production time, minimal labor and reduced waste. The machine removes the florets from the stalk of the vegetable which are then sized, sanitized and inspected. The potatoes pass through abrasive rollers that scuff and remove a majority of the potato skin layer, then hundreds of stainless steel blades give that homemade appearance of being cut by hand. The potatoes are then inspected, washed, treated, and packaged. We have also recently added a new line that has helped provide the ability to chop and dice cabbage with minimal labor. Very popular for dumplings and coleslaw. The same machine can be used for both green onions and chives. Sunfresh Farms repack department has the ability to take large cases of various locally grown produce and repackage them in a variety of different sizes and packages. We can package mini cucumbers onto trays in packages of 6, 8 ,10 or 12. We also can bag mini cucumbers into 1 and 2lb bags or bulk 20 and 40 lb boxes. The repack department will also bag three count assorted peppers, four count assorted peppers or in a size of your choice. We have two modern pepper wrapping machines that can place peppers into a zip lock style bag or into a BOPP film to make rainbow packed peppers. These rainbow packed style peppers can be customized to the colors of your choice. 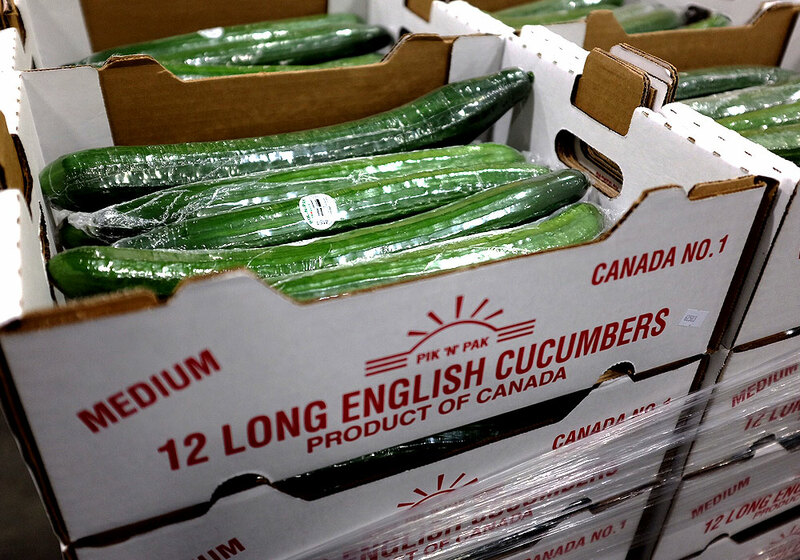 We also have the ability to shrink wrap Long English cucumbers into two and three packs for multiple item sales. This same machine can also shrink wrap eggplant and broccoli for your convenience and shelf longevity. If your need is for a smaller pack size of fruits such as bananas, apples and oranges, just let us know and we can customize and tailor to your needs. We are able to do regular or cold freight deliveries in the Edmonton and surrounding areas. We also can move freight to and from Calgary to Edmonton. 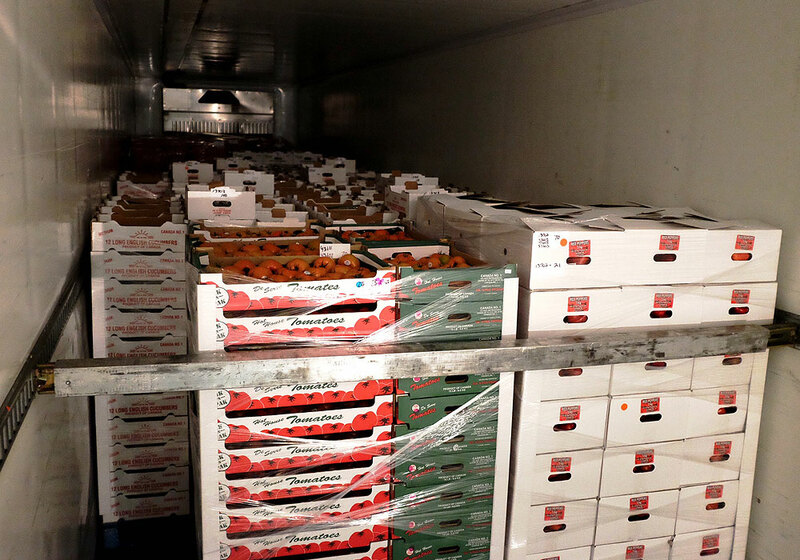 At our warehouse, we have opportunities to do cross-docking of fresh fruit and vegetables along with many other items for customers who have limited warehouse space or are in need of an overnight holding spot.